Diamond Tiara watched in disgust as Blueblood left the room, wondering why someone like him was ever allowed to be royalty. When he finally left into the hall, closing the door behind him with a slam, she turned back to the princess to continue where she left off. "Princess Celestia," she said, choosing to skip the formality this time, "I came here to ask for a personal a favor." She gritted her teeth at the thought of her next words, but she continued regardless. "...I need you to change my cutie mark." The mare woke in her room. Light had tickled at her eyes, and she moaned slightly as she tumbled out of bed and towards a dresser not too far away. With a few stretches, Peppermint levitated an envelope - one with the wax seal on it broken. It was a letter from the school that she taught choir at - acknowledging her day off. A small smile snuck on her face before she tucked the letter away, before going to get something to eat in the kitchen. With Peppermint's stomach full, she grabbed her pendant and put it on before heading out the door. She then headed towards the castle, and ultimately, the throne room. "Today, Peppermint. Today." she whispered, before humming a small tune that she knew. Shaking her head, Peppermint headed into the castle and made her way to the throne room. Twists and turns disoriented the mare, but with the help of kind ponies along the way, she eventually arrived at the doors. To her surprise, a colt with a strikingly white coat and a blonde mane/tail combination was already at the door. "Hello?" she asked, tilting her head. The princess would not yet mention, there was no magic that could change a pony's cutiemark. At least not magic that lead to any sort of stability for a pony or have drastic consequences. The little magic that could effect a cutiemark was rare and worked in a harmful manner to a pony, though Twilight had mentioned a more recent magic which Celestia was uncertain how it even worked. The guard, Golden Dawn for his apart, would be shocked at his friend. He could not understand how any pony would ask something that this from the princess and he would ask softly, “Miss Tiara, why would you ask that.” He too was a bit concerned, though his expression was much more that of confusion as he tried to consider why Diamond would even want her cutiemark changed. "Because," she said, staring at Celestia, "your cutie mark is supposed to be your destiny, a mark of who you truly are. Well, what kind of destiny is this?!" she said loudly, looking back over her flank. She turned back to the princess, eyes shimmering with emotion. "My entire life, everything was given to me, and I loved it. Except none of it was worth losing out on who I truly am. My cutie mark is just like this thing on my head..." she said angrily. She flicked her head violently downward as she did so, causing the crown to shoot downwards toward the floor, bouncing twice before landing at Celestia's feet. She kept her head to floor as she spoke again, unable or unwilling to hold it up again. "It's worthless. And I don't want to spend the rest of my life being reminded of that. So just change it," she said sadly. "Please." The princess would consider the filly for a moment, before quickly and quietly towards Diamond Tiara before enveloping the filly in a warm embrace with her wings. Holding her close she would ask, "I can understand your feelings of uncertainty and confusion, as you are not the first to come to me with questions of ones cutie mark." Celestia would offer a warm smile before asking as she moves far enough to look the filly in the eyes, "May I ask dear one how you gained your cutie mark, what it was you were doing when it came to appear? Think back my little pony and ask yourself what led to gaining your mark. Together, perhaps we may find an answer to what the tiara actually means." The princess had seen ponies come to her uncertain of their talent, of what makes them special. Such cases were perhaps not as common, yet every time she hear words like that spoken by Diamond it broken her heart a bit. It was for this reason, she would always put aside time to help her subjects in such time of need before Celestia understood just how important a cutiemark was and knew that it was important. The stallion wished to also offer help in some why, though for now he would allow the princess time to show her wisdom of age and experience. If anypony could help Tiara, it was Celestia and he knew that his friend would leave the castle knowing her purpose and talent, no matter how long it took. For most ponies, one's cutiemark and special talent was very important indeed thus the fear of finding one's talent useless or without purpose was quite the distressing thought. As to was the though that one was not truly good at the talent one thought they had, a crisis of identity, and all such things he knew was important to the princess as well. Golbez and Cherry shielded their eyes as Celestia's sun invaded the room, relieving just how large it actually, the griffon aloowed an impressed whislt eto pass his beak as he looked around. "Whoah!, " Cherry said as she met Solar Mid-air in the middle of the room, "This room is HUGE!" The red mare giggled shyly at her cousin, "Heh, neat echo too." "I don't think rigging would that much or a problem, " Golbez walked underneath the two Pegasi as he made to a set of massive curtains on the far side of the room, "Truth be told, I assumed we'd have to make do with using a small stage specifically built..." he turns around and looks up at the ponies, gesturing with a talon at an elevated platform that, presumably, was where musicians and singers would use during the event, "...but...looking at the size of the place, we may be able to get away with building our own stage...perhaps." "oooooOOOoooohhh", Cherry hovered down in front of the Griffon, "You mean..like...doing a full show here?" "Perhaps," Golbez folded his fore-arms and rubbed his lower bear with one talon, "I may want to get the entire team down here, I don't know, it's too early to decide anything for definite," his turned to his assistant and smiled at her, "...but whatever we decide to do, it will be big, that I know for sure." "EEEEEEEEEEEEEEEEEEEEEEEEEEEEEEEEEEEEEEEEEEEEEEEEEEEEEEEEEE.....," Cherry squealed in excitement, doing a mid-air somersault before hovering just in front of Solar Sentinel, taking his head in her hooves as she lightly squished his cheeks, "I've always wanted to do a large show! They're so big...and exciting!" Still propped up against the door, Blueblood simply looked dumbfounded at the mare, still somewhat in shock from his ordeal, ""What? ", the Prince simply stared at her, dumbfounded, breathing heavily, it wasn't only until after an awkward amount of time did he finally compose himself. 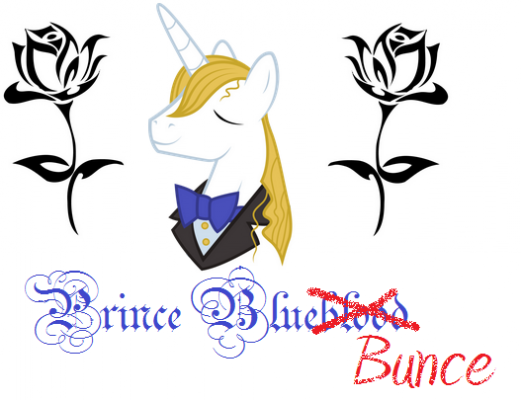 Blueblood sat down on his flank and cleared his throat, attempting to re-gain his air of authority about him as he tossed his golden mane back....rather expertly, before he returned his attention to the unicorn. He looked at the mare sternly, usually he wouldn't mind peasants coming to him, he was very familiar with ponies looking at him in awe, especially young mares, but right now after what he had been put through, he was simply not in the mood. Blueblood let out an exasperated sigh, "Yes? what is it,?" "O-Oh." Peppermint replied. "Sir, are you alright?" she added, taking a few steps before stopping herself. She didn't want to mess up anything - she didn't even know this pony! But, judging on how nicely groomed the stallion was, Peppermint guessed that he was somepony important. "If you don't mind..."
Peppermint levitated the necklace off of her neck, before lying it on the carpet in front of her. A shot of minty magic shot at it, and after the music note gem clouded up with magic, she placed it back onto herself. She blinked, before looking at the stallion in the room. "This is my pendant. My father made it for me." Peppermint spoke, pointing a hoof at the gem. Diamond Tiara looked down, gazing falling to the object that bore her namesake on the floor. She remembered the story all too well. "I got my cutie mark by putting my tiara on," she said, finally. "But before that," she said, thinking hard, "I remember something else. A few weeks before that, I started getting... ideas?" She frowned at that word, shook her head, and tried something else. She started over again. "There was this tiara in the store that I wanted, really badly. I was going to just buy it, and normally, I would have. Except, I remember getting this weird feeling, like I wanted to make one myself." "I thought I was crazy, but I just did it anyway. I ordered all the parts, bought all of the gems, and I read the books myself. I even worked the metal, even though I had to have my Dad pay somepony to help me. It took me weeks, but I finished it. I did it myself... it was the first time i'd ever done that," she added, almost in self-reflection, "I'd never worked for anything before that." Looking her in the eyes Celestia would suggest with a wisdom gained over a millennium, “I wonder if you might consider creating beautiful pieces of jewelry your special talent or that of business similar? You seem to have quite the potential for something great indeed, perhaps a designer who will decide for herself how she wishes to live her life." The princess felt she had given an answer that would please the filly, at least offer that which she could think on or ponder since she did have that which was special indeed even if she didn't realize it until now. The guard for his part would watch in respectful awe the conversion between Her Highness and the filly he had befriend, Golden's expression turning to astonishment as the princess offered the explanation she did. The pegasus had to admit, it did all make sense given what Diamond had told the princess before smiling as he worked to keep his emotions in check. His father was right, he had always been right, though Golden had come to already know this one having the honor to serve the throne as he did. The pegasus would move a wing tip over his eyes, looking away and he did hoping nopony would notice before finding himself saying, "That was wonderful." Looking to Celestia he would continued hurriedly, "Please Your Highness, forgive me for interrupting the moment." He would bow, looking down as he takes a step back, not saying anything more in his embarrassment. Prince BlueBlood raised an eyebrow in mild intrest at the mares pendant. Jewerly like its sort weren't exactly what one would call rare, uncommon maybe but it depended entirely on it's purpose. Simpler enchants such as simply lighting up in dark spaces were common amongst those that could aquire them and weren't particularly difficult to get a hold of, but the more powerful items were, the more sought after they became, thus that is what would make them rare. However, as much as the Prince could tell all this mare's piece of jewellery seemed to do was to store magic, a trait which, for the life of him, BlueBlood could fathom in what way that would be useful, perhaps in certain situations maybe but there were scarcely any that the Prince could think of. "...and pray tell, madam, what does it actually do? I should note that we are not pawn brokers." The prince sighed, barely keeping even a faint amount of intrest to the peasant before him, he continued before the mare could speak up again,"If you wish to see my Aunt Celestia she is currently busy with another peasant, so you'll just have to wait...just like everypony else." He muttered the last of his sentance through gritted teeth, not taking kindly to having been dismissed over a mere peasant. BlueBlood glanced at the large and unsigned scroll hovering in his magical aura beside him, this was deeply frustrating, the contents of the scroll was all organised and ready to go, and all it needed was an official signature to finalise it. It wouldn't have taken anymore than five seconds to sign, and she didn't even need to read the thing, but of course being the princess she was, Celestia would insist on doing so anyway, which coincidently would take time, which coincidently she would not want to use on the behalf of peasants who can't seem to solve problems for themselves, which coincidently meant that the Prince was going to be in for a long wait. "...However," BlueBlood stated, a small Amalie begining to appear in the corners of his mouth,"I believe Princess Luna would be more than delighted to assist in your enquiry, I shall take you to her chambers, follow me please," with that, Prince BlueBlood stood up on all fours walking past the mare as began to lead her towards Princess Luna's chambers. Sure, it was doubtful the princess would be in the best of moods once he got round to getting his scroll signed, but at least he wouldn't be taking the brunt of it, at least as long as things went smoothly. "That's what everypony tells me..."
Diamond Tiara started to speak, but was interrupted by Golden Dawn, who had started speaking. Something else too; was he... crying? She quickly turned away and back towards the princess, not sure exactly what she would have said. "That's what everypony I know keeps telling me. But I don't feel like I want to make jewelry." "Ever since I got my cutie mark, it seems the only thing I feel like want to do is come up with ideas. I feel... inspired?... and I do things, like making my tiara, or I get others to do things, like the time I started the Foal Free Press..."
She looked back at her flank, and then looked up at the princess, something small sparking behind her eyes. Her eyes were brimming with curiosity as she spoke. "Can you get a cutie mark for that? For coming up with ideas?" The princess would smile warmly, as she watched Diamond work things out in her head and honestly consider her words. Celestia was always glad to have her subject start figuring out answers to their questions on their own or the situations they found themselves in. Tiara was very much on the right path the white mare felt and would say, "Can one get a cutiemark in getting ideas? That is a good question, since ideas can be so versatile... or used to both help or harm. A good idea can help one overcome a great challenge, while a bad idea could bring one into even more trouble." Celestia would consider the filly before asking, "What ideas have you come up with, that have helped yourself or others. That have help you in overcoming a challenge or accomplishing something impressive, and how have your ideas affected others? I honestly feel one could get a cutiemark in coming up with ideas, though an idea can be used for good or ill." The princess hoped that not only would Diamond realize her cutiemark but consider how her special talent can be used positively. Yet, though she wouldn't say it, even a good idea with the right intentions could now work out as planned or intended and even good ideas can hurt others. Peppermint laughed slightly when the stallion spoke. "I really have no intention of that, mister." she said, before shaking her head to get some stray hairs out of her mane. "I was just wonderin', since my mom had taught me that doin' somethin like what I'd done was a little improper in a more formal setting. Oh! And this changes my singing voice." she added, before clearing her throat. Peppermint then started to sing a line of a song that she had learned a while ago. It was in an almost flawless tenor, well out of her normal range. He wasn't even paying the slightest bit of attention to the poor mare, instead entirely focused on leading the sucker pony to Princess Luna's chambers as quickly as possible. His pace quickened slightly as they navigated through the maze of hallways that make up the castle, guards and servants alike simply glanced at the Prince and Peppermint, one or two did look at them with a curious look, but being familiar with the prince if he was up to something it was, one...most of the time something not very good at all, and two...far better to not get involved. At last The prince stopped at a pair of large double doors, an emblem of the moon baring Princess Luna's Cutiemark was perched above the door in beautiful pale blue marble, in front of Luna's Chambers stood two guards ponies, both of which looked at the prince and then at each other with doubtful looks. "We are here to see my Aunt Luna," Blueblood declared, albeit noticeably in far more quieter tone, "Your highness, Princess Luna is fast asleep, she was already denied some of her sleep this morning alre-," , "Are you questioning me? Peon?" The prince raised an eyebrow as he looked at the guard sternly, "Uh..no your highness, it's just it would be very unwise to-", "Go and patrol some corridor somewhere, we have urgent business with my aunt to tend to and do not wish to be disturbed,", "But-", "Begone with you." The prince merely raised a hoof and offered a dismissive gesture at the guards, they both looked at each other before hesitantly leaving their posts, one would mutter, "His funeral, " under his breath as he passed Peppermint. Blueblood sat on his hindquarters as he glanced at the mare, smiling at her slightly as he pointed a hoof towards the chamber doors, "Go right ahead, madam, just give my aunt Luna a gentle nudge and she'll be more and willing to take your query." Peppermint watched as the stallion passed her. She intended to stay at the doors and wait for the Princess to call her in, but when the pony that passed her told her to 'keep up', she complied. As she had followed the white-coated stallion, she began to doubt her decision. When she had arrived at the doors of what were presumed to be Princess Luna's chambers, Peppermint's doubts were confirmed. She watched as the stallion in front of her argue with the guards, and she could feel her jaw drop gently as he rudely dismissed them. "Go right ahead, madam, just give my aunt Luna a gentle nudge and she'll be more and willing to take your query." "Your highness, Princess Luna is fast asleep, she was already denied some of her sleep. . ."
With that in mind, she lowered it to a panicked whisper. "Are you out of your mind, sir? Her highness is... she's asleep! It's no business of mine to disturb her slumber!" Solar just smiled at his cousin's reaction. "I guess you could build one, but I guess it would have to be built in a way that dosn't damage anything in the room." he would say, his cheeks still being held. "And the bigger, the better." It would take a few moments for the pegasus to slip his face of Cherry's grasp before he landed near Golbez. "I'm sure you could use that end of the room." as he pointed a hoof towards a windowless wall. "There's a few small rooms down that hallway you can use a dressing room I guess." Solar would hover over to a raised area in the room. "This is the normal stage. It's just used for music and such things." As the guards are dismissed, a snoring would begin to emanate from the princess's chambers. It would only grow louder as Luna rolled onto her back. A smile graced her face as she slept in the dark room. Clutched in the sleeping princess's forehooves was a stuffed Ursa Minor; A gift from one of her subjects. From the outside of the chambers it would have sounded like a dragon sleeping in a cave. Awaking the princess would surely have the same consequences. "Sir?...SIR!? ", unintentionally raising his voice, The Prince gawked open mouthed at the Unicorn as if she just grew an extra horn on her fore-head, his expression turned rather quickly as he looked sternly at Peppermint, "Madam, do you have any idea who I am? "I" am Prince Blueblood, royal nephew to Princess's Celestia and Luna and you do "not" refer to me as "sir"!" After blatingly telling the mare off, the Prince raised a hoof to his chest and took a deep breath, held it, and exhaled slowly as he stretched his hoof outward, a trick he learned from his cousin Cadence, he spoke again in a softer, yet firmer tone, "Madam, I too have business with Princess Luna to attend to as well, yet I am courteous enough to allow you the privilege to see her first." BlueBlood's horn illuminated a pale blue as the handle for one of the chamber doors lifted, as the door opened the near pitch blackness of Luna's bedroom was visible, one could even see a silhouette of Luna herself sleeping in the darkness in the far end of the chamber. The prince then looked at Peppermint, his horn still glowing as he slowly walked towards her, "However..I don't like to be kept waiting longer than I have too, so would you kindly..."hurry"..."up"." BlueBlood would surround the Unicorn with an aura of pale blue before using his magic to slide Peppermint (albeit unwillingly) across the floor and right into Princess Lunas Chamber, the chamber door closed behind her rather abruptly with a "SLAM", leaving the poor mare in a rather awkward predicament indeed. BlueBlood nodded to himself, satisfied this would get the job done, standing to the side of the Chamber doors, he used his magic to hold the door handles firmly, preventing them from being opened from the other side, "Sir....hmmph..the very idea..."
"Hmmm, that would be satisfactory, " Golbez began to walk towards the space by the windowless wall that Solar had pointed out, he turned to face outward into the hall and held up his open talons, as if trying to get a picture of what it would look like if a stage where to be built here, "Yes, yes, Good view of the hall, can practically see most of it here, and you said there were spare rooms we could use?" Golbez raised an eyebrow towards Solar curiously, "Would you kindly show me?" Cherry however was more preoccupied at looking at the elevated stage, sitting in the middle of it as he watched her cousin tending to Golbez's wishes, she giggled, she was excited about what was to come. "My apologies s- I mean, your highness..." Peppermint apologised, looking at the prince. "I would never do it again, Mint's hon-" she began to add, before a blue aura lifted her into the air and into the room that was opened earlier. Peppermint struggled with all that she had to break it, but was too late - the doors slammed before she could get out. Her heart began to pound with worry. How would she explain it to the princess? Peppermint would tell the truth, and maybe speak bitterly of the prince. But, for now, she knew that hiding was probably her best bet. She levitated her necklace off her neck, before waving it around and looking for a place to hide. She found a large pillar not far, so she dove to that. Peppermint then placed the necklace back on. Then, she peered out from her position to look at the silhouette known as Princess Luna. Her head then darted back as she sat on her behind, breathing as silently as she could in hopes that she wouldn't be scolded, or worse - dead. Figuratively, of course. "Well..." Diamond Tiara drew out, thinking for a bit. "I made the decision to be class leader, and I worked hard for it. I'm the one that comes up with most of the school events, like the talent shows and the plays. I came up with the idea to bring back Ponyville's Foal Free Press and become its Chief Editor, even though I ended up getting demoted. I even come up with ways to help my Daddy's business, even though I don't know a lot, and it usually doesn't help much..." she said, drawing off a little before returning. She looked at Celestia, a fierce determination in her eyes. "So coming up with all of these things... is what makes me special?" Princess Luna's right eye shot open when her chamber door slammed. After a few moments it would lower before both eyes would open. A light beam would emanate from the princess's horn as she illuminated a clock hanging on a wall. "Ugh," the princes would say in disgust. She would lay there a few moments before crawling out of bed. "I give my guards orders to not be disturbed, and they slam every door in this wing of the castle.." Saying Luna was grumpy would be an understatement. Luna enjoyed her sleep almost a bit too much, and it had been cut short, twice in the same day. The princess would make her way over to her window. A magical aura would slowly open them, allowing a bit of natural light into the room. The light would reveal the condition of the princess; her mane having a serous case of bed mane. With a sigh, the princess would walk over to a large mirror and begin to make herself presentable once more. Suddenly the princess would stop, raising an eyebrow as she notices something in the mirror. Luna would slowly walk towards the pillar that Peppermint was hiding behind, each step growing louder on the marble floor as she neared. Luna would wait for the mare to show herself. Peppermint held her breath as she heard hoofsteps. Deciding that she had been caught, she took a sigh before coming from her hiding spot, head low. "Your highness, Princess Luna, I am terribly sorry for waking you from your slumber." she spoke, keeping her minty eyes on the ground. "I was dragged in here against my will by your nephew, Prince Blueblood. He had forced me in here. I had no choice." She felt bad for telling on the stallion, but she promised herself to tell the full truth. "I came here with all intents to see Princess Celestia. I will admit, I followed the prince here in curiousity. I never would have gone in here without your express permission. I just..." Peppermint began to say, before she felt tears in her eyes. "I apologise, your highness..."
Golden Dawn would step and placing a hoof on her shoulder say with a chuckle, “I sure think it does, though I already thought you were special.” The young guard was grateful he could be a part of this, and was even more glad to have met the young filly as he did feel she was special. The stallion would look to his princess though, worried about her thoughts on yet again interrupting the two of them. Celestia hoped this was the answer the young filly needed, and that it would allow her not to feel like she had no place or purpose. She wished only for the happiness of her subjects, that her words and actions could make a difference though she was only one mare. It was moments like this that the princess felt allowed her to truly connect with her subjects. His patience beginning to wear rather thin, Blueblood had resorted to listening in within Princess Luna's chamber by pressing an ear against the door, it had been curiously quite for some time that the prince was starting to ponder just how heavy a sleeper his aunt really was. The murmurs he could pick up from within the room were faint, but at least loud enough for the Prince to pick up on, ".....dragged in here against my will....your nephew........ Blueblood.......forced me in here....I had no choice." "That ungrateful little commoner..." said BluebBood, quietly through clenched teeth. This didn't sound good at all, not so much that he just been "landed in it", but more the fact that Princess Luna wasn't what one would call "merciful". He only had a few moments on how to best approach the situation, he had just ""persuaded" a common pony into the Chamber of Princess Luna, just in order to both wake her up and take the brunt on having been woken up, there was noting wrong with that surely? So how to go about it, perhaps he could do the right thing and take it on the chin, admit that he was in the wrong by doing such a selfish act just to get a rather important piece of documentation signed...or he could run, it certainly didn't sound like a bad idea, there wasn't nothing to suggest the commoner was in the right the right if he wasn't there, plus the situation didn't seem to be improving any time soon. Prince BlueBlood there and then decided to "bravely"...leg it, running down the hall as quick as his manicured hooves to take him, which wasn't to say that quickly. If one were to appear from the chamber soon, they may have been able to catch a glimpse of BlueBloods tail disappearing behind a corner, but they'd have to be quick ! Though not fully awake, Princess Luna was upset, though not surprised. "You have a lot of nerve to disrupt the slumber of a Princes of Equestria, as well as entering a restricted part of the castle without invitation. Perhaps you would like it if I where to come into your chambers and disrupt your rest when you have been deprived of it. I have half the nerve to...." Upon hearing the name of her nephew, the princess's tone would change. "Oh. I see." Luna's face would change from anger to than of no expression at all as she listened to the mare. A loud sigh would escape Luna's muzzle. "I accept your apology. Twas not truly your fault." The princess would take a seat near the mare. Looking to the mare with an uneasy smile, Luna could not stand to see her unexpected guest cry. "Tell me your name subject. Though I am not my sister, I may be able to help you out. Tis the least I can do for the trauma that Blueblood has put you through." In habit, the mare closed her eyes as she braced her punishment, but was thoroughly surprised when Princess Luna changed tone. Peppermint looked up in the princess in shock at her offer. "Peppermint Harmony. I've heard of a royal choir." Peppermint said. "It's my life's passion to sing - and it's my job, too." She paused to look at the cutiemark on her flank. "And, above all, it's my destiny. I was wondering... if... there's a chance to try out. I have a piece that I'd love to perform for you to show you that I am most ready if I am to join." she added, before looking down to see if her necklace still held the spell - the gem was still cloudy, so it did.